Anyway, that’s the background surrounding the trip, so on Tuesday we headed from Aberdeen to London, then connected through San Francisco and onto Los Angeles were we arrived in the evening. It was pretty much a full day of travel by the time we arrived, so rather than commuting Downtown or elsewhere to a hotel, we just stayed near LAX and got our heads down for the night. We were lucky enough to arrive a day earlier than everyone else, so woke up refreshed, hopped in the rental and headed to the Farmers Market in Fairfax to grab some breakfast. The Farmers Market is a pretty incredible place to be honest, and whether it’s breakfast or lunch you’re after, I highly recommend checking it out, there’s something for everyone! 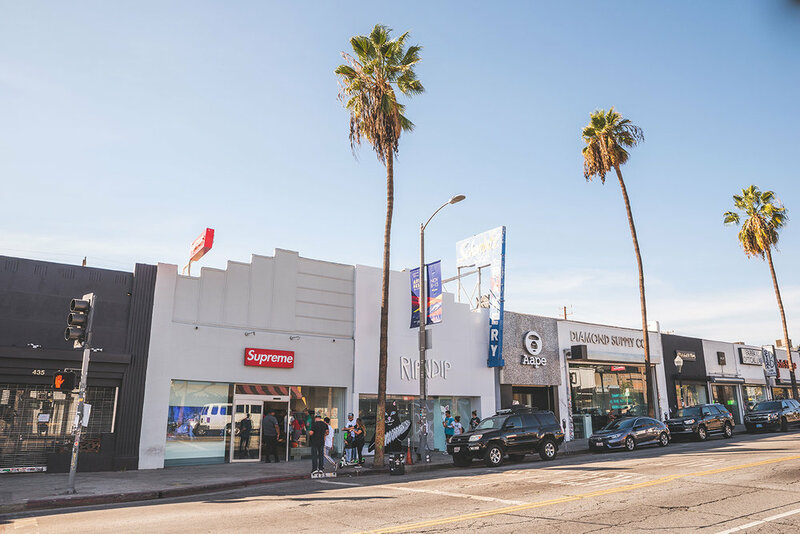 We had a little bit more time to kill before heading to our hotel for the next few days so checked out a couple of retail spots nearby such as Supreme and then over to Sportie LA. Trying not to exhaust ourselves with retail on the first day, knowing that the next couple would be spent doing much and such the same, we headed to the Mondrian Hotel in West Hollywood to check-in, met up with everyone else, had a few drinks, then headed out to CATCH LA for dinner. Since it was Halloween, everywhere was mobbed, and we couldn’t catch an Uber back to the hotel (which is far from ideal in somewhere like LA), so we decided to walk it. Thankfully, it wasn’t actually that far away, and we took a bit of a detour through the most mental Halloween street party I’ve ever seen. America fairly take the ol’ Halloween thing seriously, eh? Check out some pictures below from the first full day! The next day consisted of retail, retail, and more retail, but it was great to check out some of the spots as I never managed to do it when I was there in January. Some pretty impressive stores to be fair, but my favourite in terms of product was probably Sportie LA as it was great to dig around in some unusual pairs, and then in terms of the space, Stampd was my favourite. There’s only so much retail you can do though, so it was time to patch it, go back to the hotel, chill out for a bit and then head out to TAO for dinner and then drinks. Check out some pictures below from our second day! Kicking the day off with breakfast at the hotel (pancakes of course), we then headed to DTLA to the adidas office for a brief meeting before checking out some more retail spots in Downtown. DTLA is by far my least favourite part of the city so I tried to spend as little time there as possible to be honest. Some of the retail spots weren’t up-to much either, so we hopped back in the car and headed across the city to the coast, and specifically, Santa Monica/Venice Beach. I mean, you can’t come to LA and not visit the beach, right? We parked the car nearer Santa Monica Pier and walked along there, grabbed a few shots then headed down towards Venice Beach and stopped for lunch on the way. There’s something pretty weird about being in 25 degree heat at the beach in November but I certainly wasn’t complaining. Of course, the last stop was the Venice Beach Skate Park for a little bit, then we headed back to the car and then to the hotel along with navigating some rush hour traffic. This was our last night staying in West Hollywood before we would head down to Long Beach to stay for the final night, so we all went out for dinner to BOA and then followed it up with some drinks nearby. As I said above, we went down to Long Beach for the event the next day, so this is where this blog post ends and you can see what we got up to at ComplexCon here. Incredibly grateful to make it out to LA again, never mind twice in the same year, and thanks very much to adidas and Reebok for the hospitality! Check out some pictures below from our third day!